Chomping my way through a country’s food | Where to next? 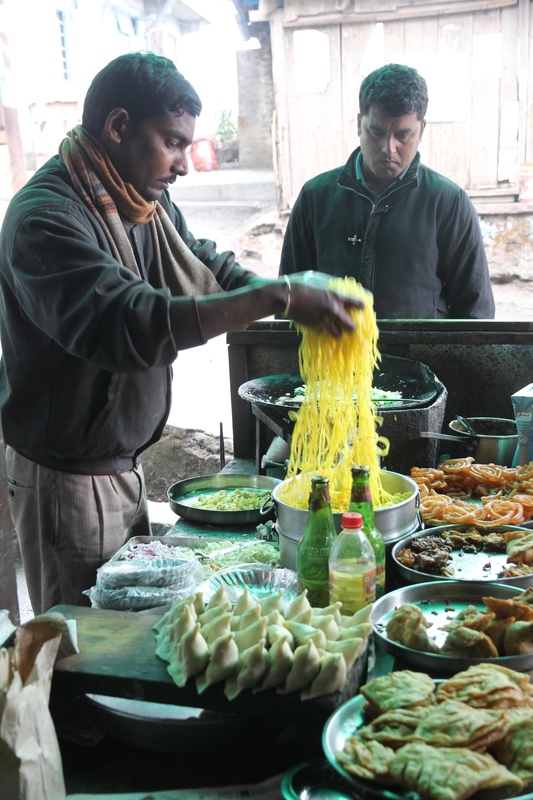 We’ve been eating our way across India and we have the waistlines to prove it. Thankfully, I can still do up the top button on my shorts and trousers. So here are the facts—in almost 10 weeks we’ve visited nine Indian states, covered well over 11,000 kilometres, sampled all sorts of cuisines and eaten more than 200 meals, plus a lot of snacks. Can’t say we’ve had a bad meal in all that time. Sure, some have been better than others, and some have been sensational. We’ve had some amazing snacks too. The other day, I realised I hadn’t said much about the food on this trip, so it’s time to bring you up-to-date. While I don’t have pictures for all the delicacies, I can give you a run down on some of our recent favourites. Top of the list has to be the paneer roll we had in Angul in the state of Orissa. Paneer is a fresh cheese common in Asia. It’s made by curdling milk with lemon juice, vinegar or some other acid. It’s easy to make at home and I’ll post a recipe when I’m back in Australia. Confession: I bought a paneer cookbook yesterday and here’s hoping there are some guiding recipes in it. Anyway, back to that paneer roll. Deepti went into a small shop to order five of them—for her, Anand, Gary, Poor John and me. We were starving (it was a late lunch) and she didn’t return for ages. Good grief, were they milking the cow? But the wait was worth it. That roll, with oodles of paneer and cooked chillies and veggies in a tomato sauce wrapped in a homemade roti, was out of this world. We could have eaten two, even three, and we all said it was the top treat of the trip. So finding an equal has been a mission ever since. The chicken rolls we had from a street stall in Ahmedabad came close. The big bonus at this stall was being able to watch and photograph the fellows making them from start to finish. First roll out a roti. And while it cooks, crack an egg onto it and swish it around. Gosh, they make it look so easy. 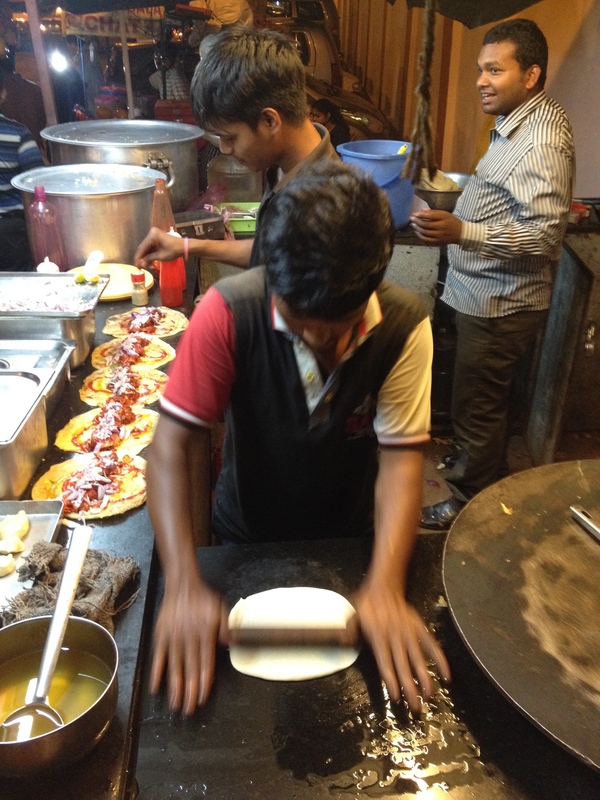 Then line up five cooked rotis to receive the toppings. There’s a squirt of oil (not sure what kind), then a squirt of some red sauce (catsup or chilli? ), then a liberal dose of cooked chicken in a tomato sauce, and then a generous sprinkling of finely chopped raw red onion. Finally, wrap it up and hand it over. Now I have something to go on if I want to try making paneer or chicken rolls at home! 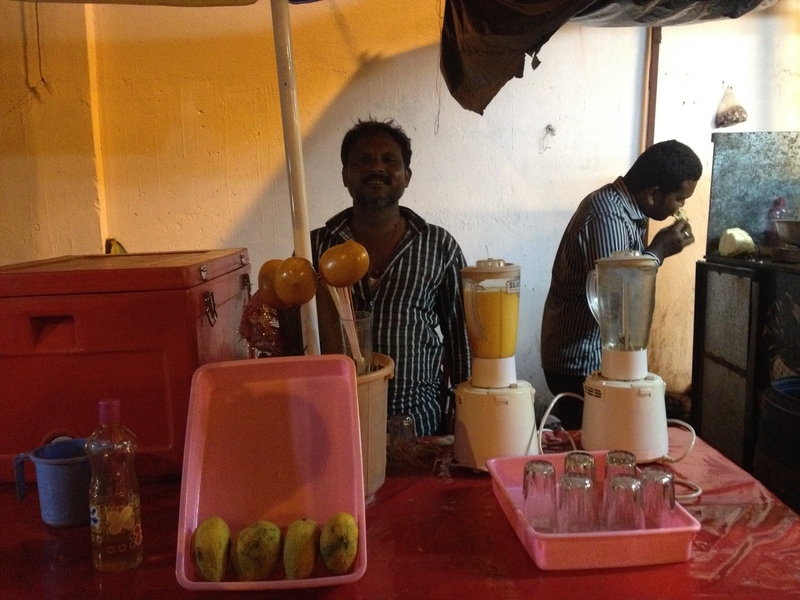 We washed our rolls down with glasses of mango juice—really expensive at 20 cents a glass. The proprietor, whose stall is next to the chicken roll guy, says he squeezes 15 kilos of mangoes a day in the off season and about 40 kilos in the on. Mangoes will be ripe about six weeks after we leave India. Darn! We had an interesting breakfast in Chalsa, after visiting a so-so game park. 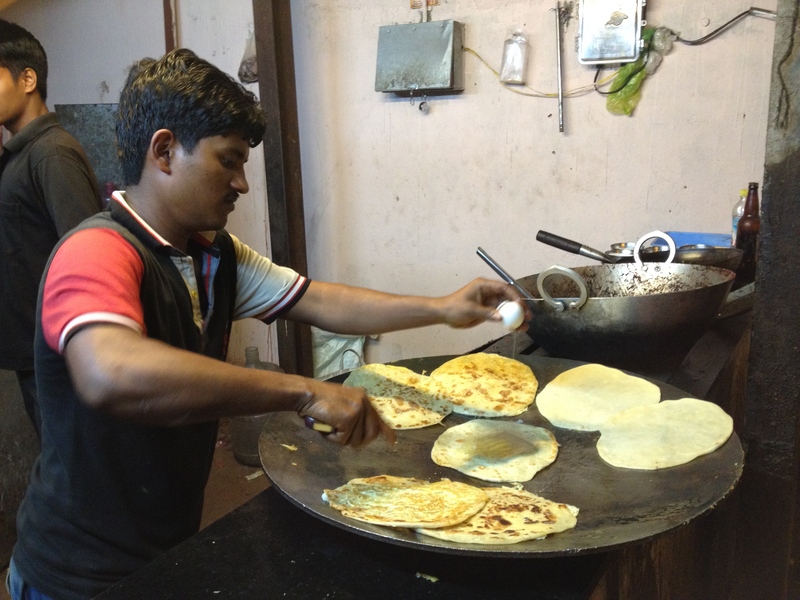 We stopped and the woman said she had only one dish—a combination of puri breads and a chickpeas and potato curry. Simple and delicious and as soon as we emptied a dish, she replenished our plates. No wonder our waistlines are expanding at a frightening rate. 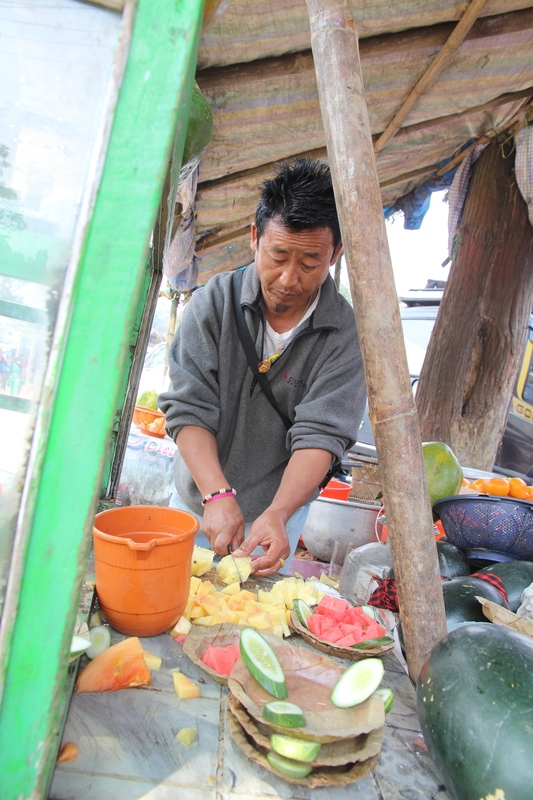 Another find was the fruit bowls in Mirik, a popular tourist town north of Darjeeling. The fellow running that stall was a whizz. As he worked, bag after bag of pineapples, watermelons, papayas and cucumbers were being delivered to his roadside stand. 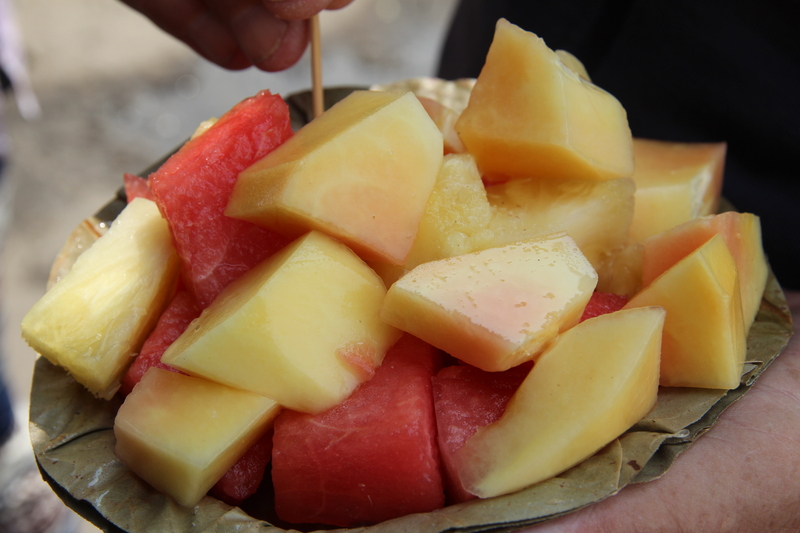 It took him seconds to peel and chop all those fruits to create a bowl of colourful and healthy nourishment. And several things made the fruit extra special. Obviously, fruit is seasonal, so with the exception of bananas, mandarins, grapes and pomegranates, the variety of fruit available has been limited. Quantity has been limited too. So it was great to get this full-on hit of vitamin C and new fruits as well. Also, the fellow offered bowls of black salt (or kala namak) to sprinkle over the fruit. The raw material for black salt is mined in Bangladesh, India, Nepal and Pakistan. It has a distinctive pungent taste, and I’ve bought three lots of it to take home to Australia. If I believe the hype, I can use it to cure goiters, treat hysteria, relieve heartburn and intestinal gas, and more. Maybe I’ll never fart again. The final bonus was that the dishes were made of leaves that had been pressed together and shaped into a bowl. It really was the optimum use of biodegradable products. Two other winners came from a hole-in-the-wall eatery in Lava, a small hamlet near Kalimpong in the hills of West Bengal. We drove up there for an outing and arrived about lunchtime. There were restaurants galore but no one seemed to be in the mood to cook. They kept urging us to go to the Orchid Restaurant which they said was in the market about 200 metres up the hill. 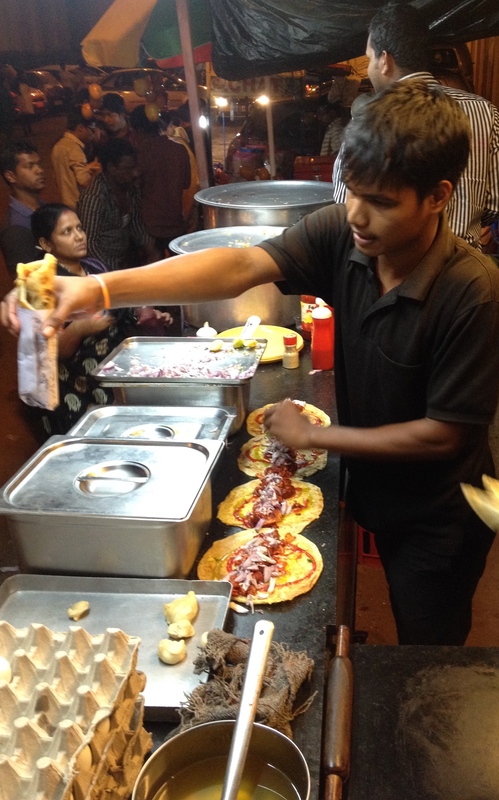 Anand speculated that the restaurants we saw might think foreigners wouldn’t enjoy their food. 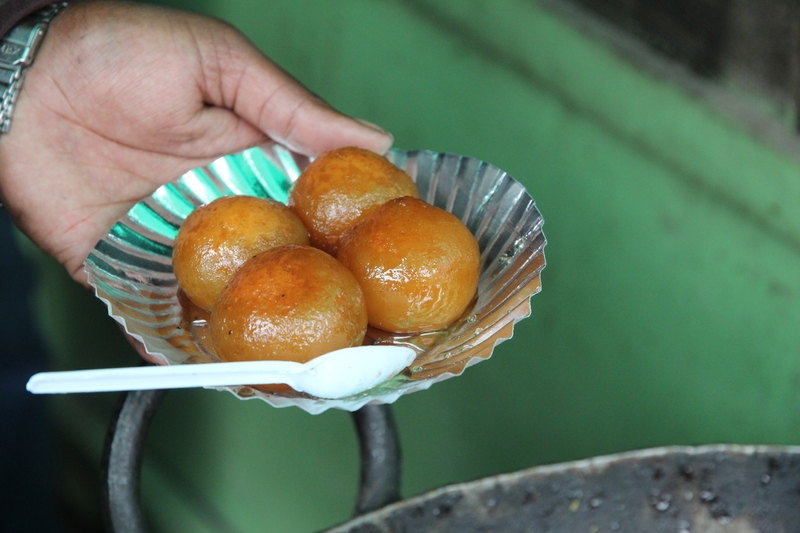 We trudged uphill—it was steep—for 300 metres or so without coming upon the Orchid, but we did see a fellow cooking a deep vat/wok of sweets that we refer to as ‘sugar bombs’—one bite and your mouth gets an explosion of sweet syrup and dough. He also had platters of samosas ready to hit some fat. Anand ordered a round of samosas and five servings of noodles. The chef/cook swapped over his woks and fired into action. 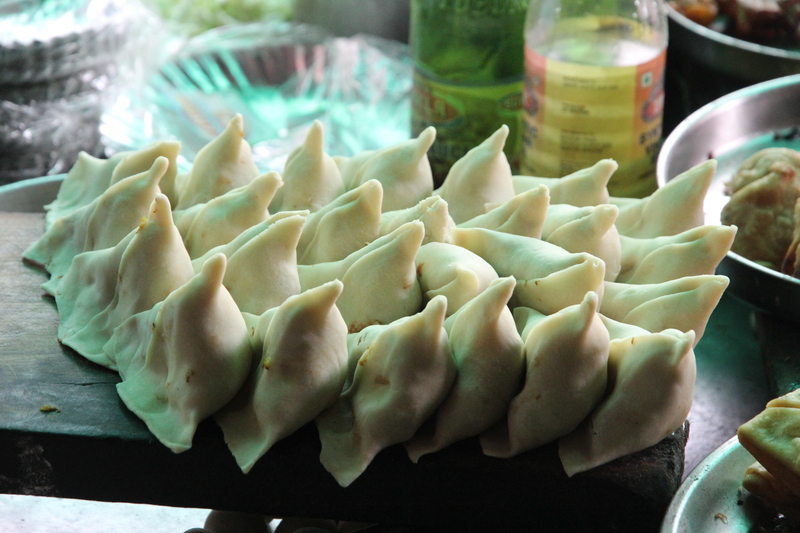 The samosas arrived in no time and they were the lightest and tastiest samosas I have ever had anywhere in the world. The dough wrapper was perfect. The filling was perfect. So we ordered another round. Then he got to work on the noodles, frying spices, onions and other veggies, and adding homemade noodles (not those 2-minute impostors). At the end and even though we were totally full, we ordered a round of sugar bombs! It was all pure deliciousness. And the whole spread, for five us, cost about A$8. Well thanks a lot. Just as I read this “Maybe I’ll never fart again.”, I took a sip of wine. I’d better not read and drink at the same time, it seems! Oh dear, maybe I should add a warning to the previous sentence. All that food and no delhi belly? You must have a cast iron constitution. It’s a combination of cast-iron stomach and knowing what to avoid. Street food is usually safe because it’s cooked on the spot. You have to worry about the food that sits for long periods in the open air. Mayonnaise is a huge no-no. Spot on.. As long as Street food is cooked on the spot.. It’s the uncooked Street stay like chutneys & cut+stored fruits/veggies, the ‘Masala water’ in Pani Puri/Gol guppa that one should be wary of..
You are o right. Knowing what to avoid makes a lot of difference. I live vicariously thru your food travels. I’ve had pink salt, smoked grey salt, and even an earthy tasting brown salt…. but never had black salt. Now I want black salt! You’ve unleashed the salt beast in me. Maybe I can find some in the bulk bins at Whole Foods. I wouldn’t think of putting the salt beast back in the cage. Try an Indian food shop if you want the same thing. And let me know if you find it. We are finding your blog marvellous to read. Air Asia have recently had a heap of specials and we have booked flights to Hyderabad for the month of January. Nothing else organised yet but there’s plenty of time. 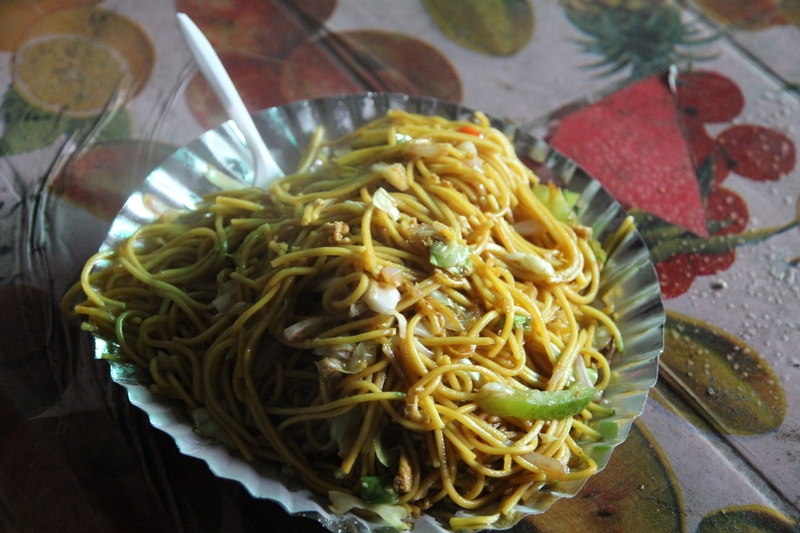 Some breads are made with besan (chickpea or gram flour), but I think the noodles and samosas would be a risk. You’d just have to travel with a note (written in the local language) saying what you can’t eat because of allergies. Mmmm. My tummy is telling me these photos are yummy looking 😉 I’d love to try black salt also, will hit the Indian store. Never fart again. .. That’s no fun! Ha ha! I’ll be checking my Indian market for black salt too, so I can buy some for friends. Now I’m really hungry. What a fantastic food adventure. When you see all the food being handled without those horrible plastic gloves everyone here has to use it makes one wonder if we are all a bit too precious about super hygiene . Super hygiene will probably be the end of us. No one will be immune to anything. I’m very upset with you writing this post. Your pictures and descriptions MADE me go and eat 1/4 gallon of ice cream because I couldn’t find the ingredients for the food you described. Now I’m sitting here with the zipper undone on my pants longing for Indian food. Guess I’ll go and finish off the other 1/4 gallon . . .
P.S. Please just write about animals and people from here on out so I don’t gain more weight. Best thing I find about eating local – it is never hard to find really good food! You are so right. Good food is everywhere on the local scene. Palak Paneer has to be my all time favourite vegetarian Indian dish. I used to make it from a recipe in Charmaine Solomon’s Asian Cookbook (just substituting the peas in the recipe for a bunch of young spinach). Love Indian food, but not the really hot spicy stuff – I prefer dishes where you can taste the meat or vegetables, not searingly hot chilli killing everything. I agree completely. I love Indian food, but I like to taste the food, not just the heat. I’m cooking a curry tonight and it has lots of spices but only two dried chillies. It’s a perfect blend. Oh, and I’m very partial to paneer palak too. I have a sensational recipe from a South African friend. I have some delicious recipes to share in my blog masalahealth.wordpress.com , I hope you like them. Thanks for the link to your food blog (I hadn’t known about that one before) and thanks for posting this item on your Facebook page.